The Pacific Harbors Council (PHC) Executive Board designated Camp Thunderbird as their primary camp for delivering Scouting to youth. 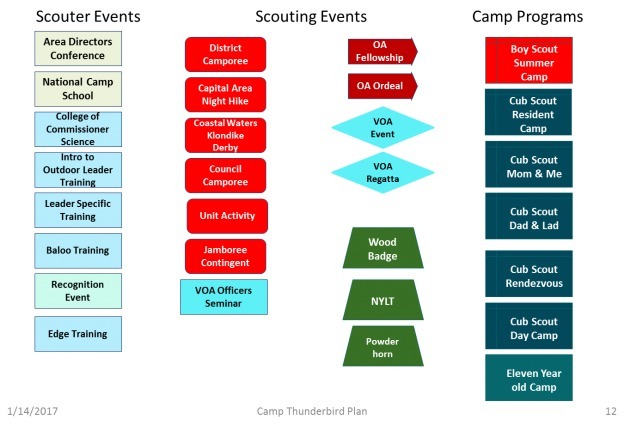 This plan identifies the programs and resources that Camp Thunderbird will need to support. This plan inventories the programs and the necessary resources to support each program. The resources are related to the Program. A simple relational database was developed to support this approach. Program � A recurring BSA event or activity for Scouts and/or Scouters. Appendix A provides the Inventory of Camp Thunderbird programs. Resources � Resources are camp facilities or capabilities that are required to be in place to support camp programs. Appendix B provides the inventory of Camp Thunderbird resources. Program Resources � Identifies the relationship between programs and resources. Establishing the relationship allows the grouping of resources by program. Appendix C is a matrix that shows the Programs and resources relationships. The plan is intended to define �what� is needed not �how� they are to be used or acquired. Although the camp does have existing resources that have traditional use, future development efforts should not be restricted from designing a multi-functional camp facility. The relationship between resources and programs also illustrates the relative priority of given resources. Resources supporting many programs are likely more important than resources that support single or a few programs.